Chip Fletcher, professor of geology and geophysics at the University of Hawaii Manoa. He teaches climate change on Pacific Islands and coastal geology, among other disciplines, and has been honored by the U.S. Environmental Protection Agency with an Environmental Achievement Award in Climate Change Science. Conversation with Chip Fletcher about the effects of climate change and sea level rise, especially on Oahu. The complete interview with Dr. Fletcher who provides detail on the composition of Oahu coastlines, their movement, the likelihood of coastal areas becoming wetlands, specific problem areas, the likelihood of a temperature increase of 3 degrees centigrade on Earth and what that would be like, and more. The maps and images in this post were found at the School of Ocean and Earth Science and Technology (SOEST) website. Find more about sea level rise in Hawai‘i and American Samoa through the SOEST site. Dr. Fletcher's interview for the Yale School of Forestry and Environmental Studies. 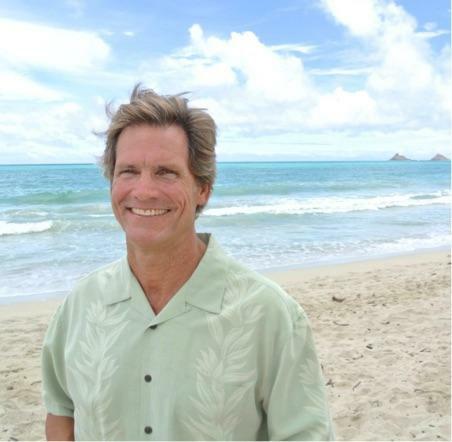 Charles "Chip" Fletcher is a coastal marine geologist, working on Hawai‘i issues since 1991. He says we have a statewide epidemic of beach erosion---seventy per cent of the beaches he’s measured are in a state of chronic erosion. Fletcher: I agree with you you just have to laugh at it because once you understand the details of this, once you get your head into it, it’s petrifying. 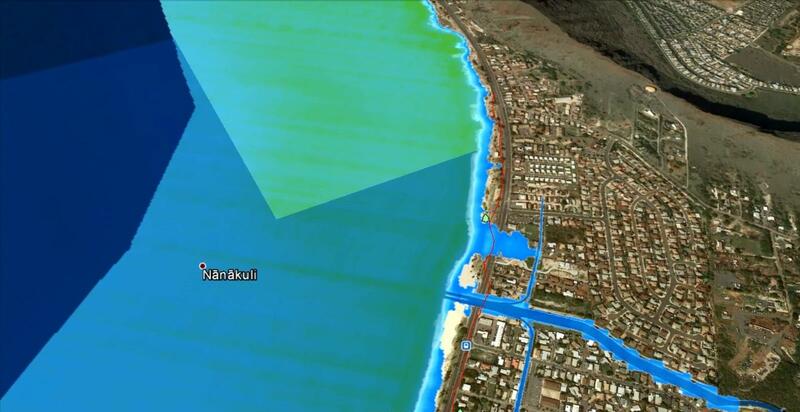 Under 3 ft of sea level rise Waikiki will experience several forms of flooding. 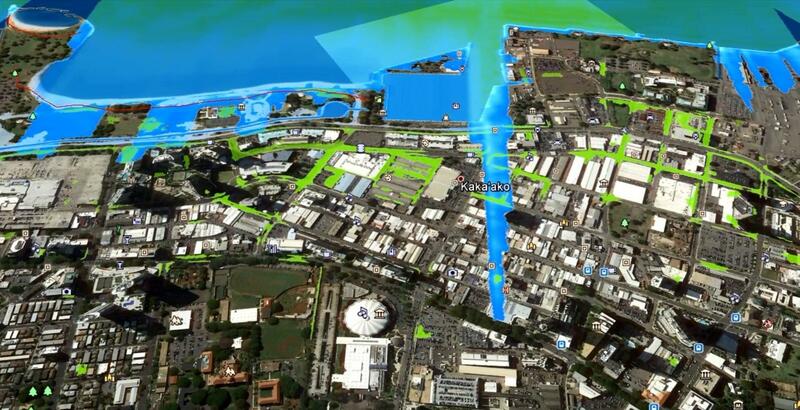 The Ala Wai will overflow its banks (blue), the ocean will flow across the shoreline (blue), seawater will flood upward through the storm drains (green), the water table will rise onto the land creating new wetlands (green), and the shoreline will erode (red line). Waves will run up onto what it today dry land. Darker blue indicates deeper water, lighter blue is shallower water. Dr. Fletcher: Yes there are real hot spots. Kualoa beach park, the highway is getting undermined right where it turns. The park itself is receding. You see old manhole covers located off shore. In some of the king tides we’ve had this year, the waves come up over the beach and they run halfway across that park. Fletcher: We saw in April and August, the highest water levels ever measured at the Honolulu Tide Gauge. We may not see these high levels again for a couple of years, or we may, but they are a glimpse of the future and we definitely will see them in a decade or two or three as sea level rise keeps inexorably pushing its way onto the land. Sea level rise manifests itself in several ways. One is beach erosion. Fletcher cites Waimānalo and Kailua as examples. Built on sand, Fletcher says that sand will erode away and the beach will move inland. Sea water, he says is also filling our storm drains, so when it rains, there’s nowhere for the water to go except flood the streets, for example in Waikīkī and Kaka‘ako. Ala Moana. This is a flooding scenario showing 3 ft of sea level rise. Blue is marine flooding as a combination of annual high waves and high tide passively flowing out of the ocean. Green is groundwater flooding and storm drain flooding. Red line is coastal erosion. Fletcher: Now for a couple of decades, Mapunapuna has been experiencing this flooding and it's gotten worse and worse. What could we do about that? It’s as though it’s coming out of the ground. Fletcher: You’ve identified and third way that sea level rise enters our lives and that is that the water table in the coastal plain area, Kaka‘ako, Waikīkī, Kailua, Waimānalo, the water table under the ground we know goes up and down with high tide. As the ocean rises from climate change, the water table rises and a water table that breaks through the land surface creates a very common environment, known as a wetland. That’s what a wetland is. So we will see first at the highest tides of the year, then in a few decades the highest tides of the month, then high tide every day, we’ll see these occasional wetlands that become more and more frequent and finally are permanent wetlands in places we hadn’t expected wetlands to be, like downtown Kaka‘ako or Kailua. This is already happening in Miami Beach. Kakaako. 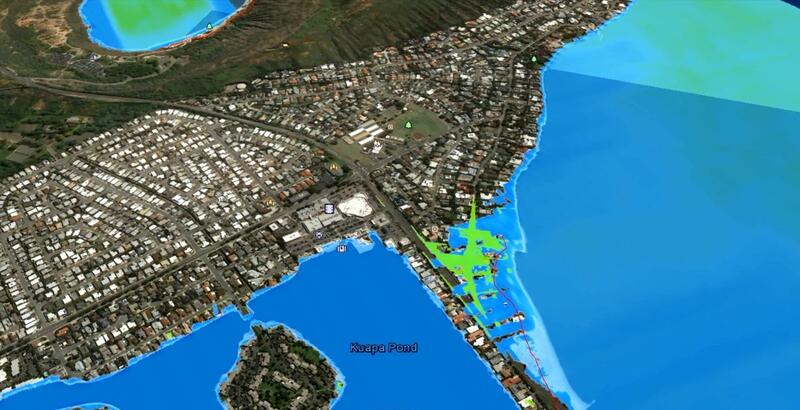 This is a flooding scenario showing 3 ft of sea level rise. Blue is marine flooding as a combination of annual high waves and high tide passively flowing out of the ocean. Green is groundwater flooding and storm drain flooding. Red line is coastal erosion. Fletcher: They bought a couple of centuries of time in Kaka‘ako by raising it with this fill. Roughly two feet of fill. Our modeling shows that at high tide, the highest tide of the month, the water is about two feet below the land surface there. Fletcher: I’m not a structural engineer, but I don’t think this threatens the foundations of the buildings. I think the foundations go well below the water table and it doesn’t really matter where the water table is as far as supporting these buildings. pronounced groundwater inundation in that area producing temporary wetlands, then permanent wetlands. Before then we will see salt water coming up in the storm drain system causing this storm drain inundation. There are estimates for that to happen within the next two decades on a fairly regular basis. Of course, it would be tied with high tide. And last for an hour-ish, occurring a couple of times a month, every month, and we have to drive through this, we have to navigate around this. So we’re looking at the same situation that occurs in Mapunapuna slowly evolving in Waikīkī, in Kaka‘ako, portions of Kailua, Waimānalo, up on the North Shore, any coastal community in Hawai‘i has this in their future. What could we do about this? Or should we try to do anything? Fletcher: There’s the $60,000 question. 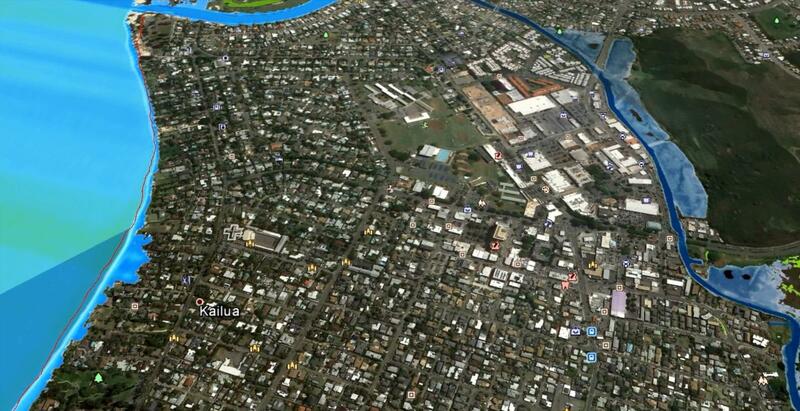 How, in an organized fashion, would we deal with the new investment in Kaka‘ako? Ewa Beach. 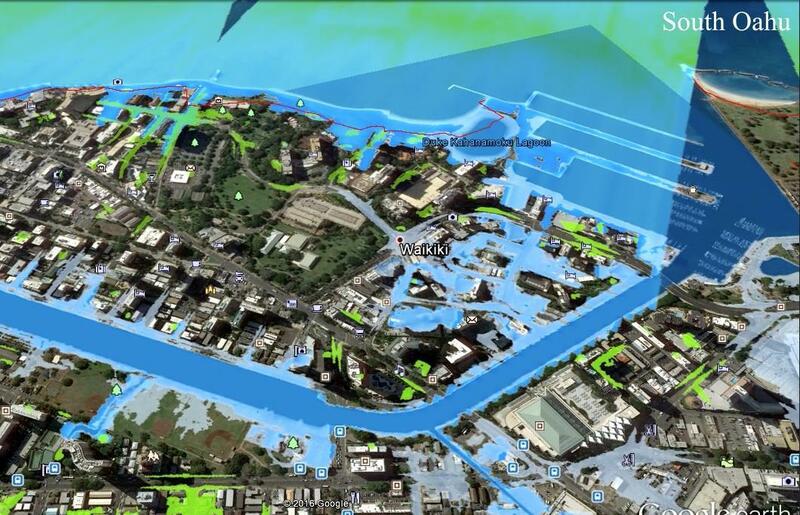 This is a flooding scenario showing 3 ft of sea level rise. Blue is marine flooding as a combination of annual high waves and high tide passively flowing out of the ocean. Green is groundwater flooding and storm drain flooding. Red line is coastal erosion. Fletcher: The Hawai‘i Community Development Authority is in charge of all that. I hope they’re aware of this widely known phenomenon that is in the media. I hope they are planning accordingly. I would think that one of those condo towers is planned for a lifetime of many decades, fifty years, more? In the course of that lifetime, there are going to be challenges getting to and from these condos because the roadways and sidewalks are going to be periodically flooded by high tide, then permanently flooded. Fletcher: I don’t hear anything about the sea level rise adaptation plans from the developers of these condominiums, but I assume they are taking it into account. Because if they’re not, if they build these things and then they sell them to someone and they walk away, they are sticking the buyer with the problem. I asked Professor Fletcher if there’s anything the state could do to keep this water from rising, yes, I know the history of questions like this, but Fletcher actually said, maybe. You could put gates on storm drains and time them to close at high tide, but if it rains, you’d have to open them and probably have a flooding problem. You could attempt to pump down the water table, but with a karst substrate like ours in many places, the limestone is like Swiss cheese, which could easily refill. Nanakuli. This is a flooding scenario showing 3 ft of sea level rise. Blue is marine flooding as a combination of annual high waves and high tide passively flowing out of the ocean. Green is groundwater flooding and storm drain flooding. Red line is coastal erosion. Fletcher: But it may work. What’s underneath our feet there is a whole mishmash of clays and sands that have come out of the watersheds over the eons, the limestone reef, the karstification of the reef, the fill we’ve put in by dredging offshore and there may be particular locations where pumping could work, but in general I don’t think its’ a panacea. Fetcher says Miami has raised roads, sea walls, and foundations, and that’s probably our direction. Fletcher: We would look to Miami for lessons learned there as they have raised their roads, raised their seawalls, raised foundations, that’s probably going to be a direction we will need to move. Fletcher: Even then it’s a stop gap. You could engineer the raising of the communities now, and you monitor the science and humanity to measure and gauge your response. At some point though, if we get up to 5 feet of sea level rise, maybe the cost benefit ratio isn’t worth it any more. Here's some really bad news. Kailua. 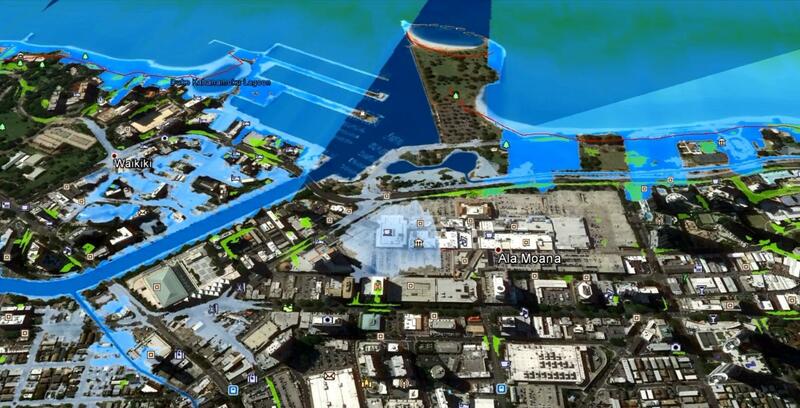 This is a flooding scenario showing 3 ft of sea level rise. Blue is marine flooding as a combination of annual high waves and high tide passively flowing out of the ocean. Green is groundwater flooding and storm drain flooding. Red line is coastal erosion. warming at 2 degrees Celsius and hopefully 1.5 degrees Celsius, above the natural temperature of the air prior to the industrial age, back in the 1700’s or so. That was a great moment, but it turns out the promised cuts only add up to about one third of what is needed to stop warming at 2 degrees C. One third. Fletcher points out, after decades of increasing carbon dioxide in the air, the amount leveled out and stayed the same in 2014, 2015, and 2016. This year, 2017, global CO2 emissions have ticked up again 2%. Fletcher: So we’re actually at a very interesting time in human history right now. Over the next 5 years or so if we can’t bend the curve so that our CO2 emissions start going down, it becomes too steep and too difficult to stop the warming at 2 degrees C. We commit ourselves to something warmer such as 3 degrees C. and a 3 degrees C world is not a place most of us want to live in. Fletcher: The socio-economic fabric of many communities will deteriorate and there’s an example of that that is already happening. Fletcher begins with the deepest drought in a thousand years of record keeping that hit Syrian and Middle East in the early 2000’s. That began a human migration that Fletcher traces to the Syrian civil war, through the rise of Al Qaeda, then Isis, and the exodus of six million Syrians attempting to reach Europe. Fletcher points to the reaction of European countries, the political swings that have emerged, and the rise of ultra conservative political parties. Hawaii Kai. 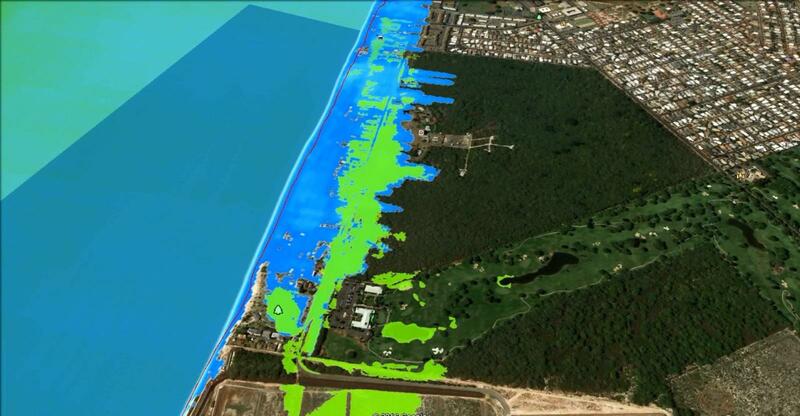 This is a flooding scenario showing 3 ft of sea level rise. Blue is marine flooding as a combination of annual high waves and high tide passively flowing out of the ocean. Green is groundwater flooding and storm drain flooding. Red line is coastal erosion. Fletcher: That long story began with the deepest drought in a thousand years which climate models have shown, has a component, it’s not 100% due to global warming but it has its roots in anthropogenic global warming, human caused global warming. And here we have warmed only 1 degree C. At 2 degrees C, and we are on the pathway to 3 degrees C, the tropics will become largely unlivable. Large parts of the planet will become unlivable because they’re too hot. The heatwaves are super heatwaves. You’ll have temperatures of 130 to 140 degrees in the summer time. You can’t grow food, you can’t be outside. Fletcher: So there’s going to be millions of people who are climate change refugees, moving around the world and depending on existing countries’ hospitality and humanity to take care of them. It’s a glimpse of the future. So for everyday people, what do we do? Fletcher: If you and I over the next ten years, can take stock of where we are responsible for releasing carbon dioxide into the atmosphere, if we can reduce that by 50%. Then if we can convince our families, and businesses, and the island and the state and the nation and if everybody does this and if it all adds up to the global community reducing our carbon footprint by 50% every decade, decade after decade for the next 3 decades, this problem will be not out of control. And I believe we could adapt to it. Drive your car less or go electric that charges through sustainable means. Fletcher: Those add up to the most powerful steps we can take. It won’t keep the water from lapping at our ankles but it will keep the water from rising to horrendous levels of six feet, ten feet. Because it will otherwise. A State of Hawai‘i Sea Level Rise Report from the DLNR and the Office of Planning is due in January 2018.